If I understand this correctly, there are basically two Bluetooth lists. There’s the actual Bluetooth list that shows devices that are paired with your phone for everyday use, and then there’s a list of those same devices that can be turned on and off for Driving Mode in the Message+ app. The original Bluetooth list is basically offering paired devices to Message+ to use for Driving Mode. Unpairing a device from the phone’s Bluetooth will affect Message+ by disconnecting it from your phone, but unchecking a Bluetooth device in Message+ will not unpair the device from your phone, it will just disassociate the paired device from Message+ and Driving Mode. To do this go into message+, click the left hand menu and then go settings. In settings, click “Driving Mode” and uncheck all devices. Unchecking these devices in Message+ will not disconnect your Bluetooth device from your phone. It just disassociates Bluetooth devices from the Message+ app. Don’t forget to turn off your “Driving Mode” option from the main menu. As far as I can tell if you have it connected to anything by way of Bluetooth it will turn it on such as a watch music anything nothing to do with driving. I think everyone should complain to Samsung they can say it is Google but if enough people leave they will fix. I had to disconnect my Samsung Gear S2 to stop the driving mode from continuously turning back on. I hate this Galaxy S7 edge AND the Gear S2. They are both terrible products. Lesson learned. I agree with the annoying statements in the reply’s. So how do we disable driving mode PERMANENTLY? I use blue tooth constantly for control of my hearing aids as well as phone calls. Do I have to change phones to get rid of this annoying app? I have disabled the driving mode feature several times, and it periodically just enables itself. What am I doing wrong?? Also won’t play my music from phone. Have to pick phone up and hit play. I think Samsung should offer a fix. For safety we need it paired to the car while driving so we can use the Bluetooth, but Driving Mode shouldn’t pop on 10 times a day when we aren’t driving or even near the car. It’s not right…. This is one of the most annoying features I have ever had to deal with. Verizon keeps simply turning it off and for some reason it keeps mysteriously turning itself back on. I had to upgrade from a Note 7 which I loved but had a recall. I like this phone but that feature stinks. I am still trying to kill the feature but no success yet. ‘Whoops, I think she may have found it in Message + settings, advanced. It is due to a bluetooth issue which is my watch. I hate this annoying feature. I admire your concern for safe driving, but I have to disable it 10 times a day. I’m not in my car, I’m at work, or sleeping…but the phone randomly blocks messages. Please please please somebody help get this disabled PERMANENTLY! Super annoying that you have to disable it all the time. It goes off even when I’m sitting at my desk at work. I hate it. Can’t find driving mode anywhere even in Messages+, the left top conner has no menu key. Can anyone help? I need my driving mode on the 7 edge. To read my text messages and let me know who’s calling.how do I get it back. You can stop it. 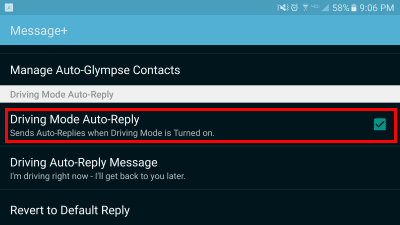 Do most of the above, but instead of clicking Driving Mode, click Settings, then click driving mode. Then unpair your devices. Then go down and turn off driving mode notifications. That should do it. Remember Settings is in the Verizon Message+ App. I contacted Samsung and they said you cannot permanently disable driving mode. You have to manually disable every time. I don’t need or want this Big Brother feature informing people when I’m in my car. Samsung blamed Google for this feature. I would not have purchased the phone if I had known. No – go to Verizon messages , then tap the 3 bars on the left corner, go to settings, the click driving mode and un-pair you devices. I agree every time I think I have disabled it. It returns when we get back in the car. Far more than annoying!!!! Is there a way to permanently disable it? I don’t want it to ever come on. So does the answer mean you cannot permanently disable or turn off the driving mode feature?